The issue of personal data, privacy and security has taken on more significance and urgency since the Facebook/Cambridge Analytica scandal than we could have imagined. If social media giants recognise that they need to embrace global standards of data protection, privacy and security, which drive transparency and accountability right from top to bottom of their vast empires, they won’t have to endure the palpable sense of mistrust felt by 87m people around the world because of the Facebook/Cambridge Analytica scandal. The General Data Protection Regulation (GDPR) marks the transition into an era in where individuals have both the skills and opportunities to choose how they manage and share their personal data, although this can be overwhelming for businesses that may feel underprepared to tackle the changes. Sir Tim Berners-Lee has consistently called for greater privacy on the web in the past, and for people to become the legal owners of their personal data and control when and how it’s used, due to rampant identity theft and the invasion of personal and sensitive data, which is now a daily occurrence around the world. Now looking to a brighter future, Sir Tim Berners-Lee predicts faster networks and more intelligent computers using Artificial Intelligence (AI); data will no longer be ‘owned’ by big corporations with sophisticated CRM and data mining tools, but by ordinary people who will make a living by selling their own personal data to these same organisations. In the future, data will work in much the same way that calendars work, where each person chooses to invite certain people to share events and information with them. Ordinary citizens will thus have much more control over what data they share with others, which is likely to become the new norm in the wake of the GDPR. The business world is gradually accepting the future internet of things and the new paradigm in personal data. Even Microsoft has claimed that we must think differently about data and move away from the need of ‘big data’ that has obsessed the marketing industry for so many years. We’ve also rapidly reached the point where people struggle to tell the difference between talking to a computer and a real human. The latest Hiscox radio ad for cyber insurance, for example, boasts that it was written and performed by a computer and challenges the listener to tell the difference. 2018 may go down in history as the ‘coming of age of the algorithm’ and the GDPR, but fast forward to 2030 and non-biological computing looks set to overtake biological computing for good – which sounds like a brave new world, providing we are still in control of personal data. 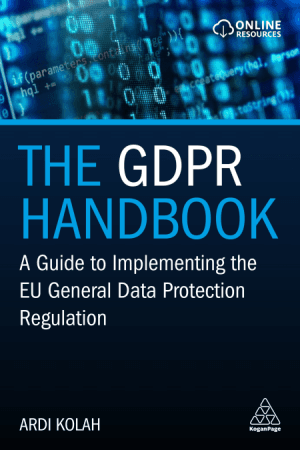 The GDPR Handbook is a thorough introduction to the EU General Data Protection Regulation. It covers in detail how companies of all sizes need to operate within the GDPR requirements and how to deal with information security and risk, specifically addressing the key duties and responsibilities of the Data Protection Officer. Using the latest research, this book will help businesses carry out Data Protection Impact Assessments, create and enforce data protection policies, train staff and manage data protection teams to prepare for a new future of data. It is the ultimate, jargon-free guide for any company or organization to interpret GDPR into clear, actionable steps.